While the gaming world finally got their hands on the risqué Grand Theft Auto V this week, I’ve been getting filthy in a different way. Far from the violence and criminal activities of Rockstar’s latest, I’ve been tending to a farm, foraging for nuts and herbs and generally becoming one with nature, in the latest Harvest Moon. 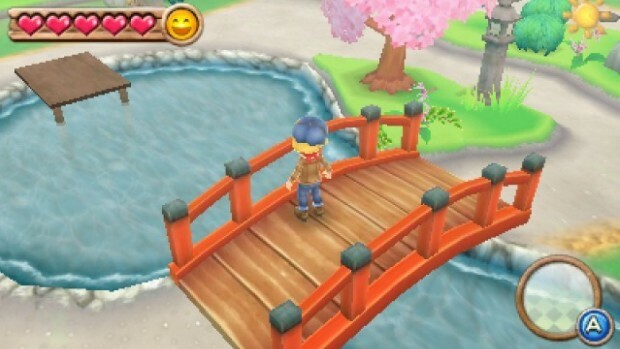 Long-time GodisaGeek readers may know that I’m no stranger to the series, having played a handful of previous games and reviewed the last entry (Tale of Two Towns) for the original Nintendo DS last year. That game was also available for the 3DS in a barely unchanged form, while A New Beginning has been created with the 3DS in mind. It’s certainly taken its time to get here too, having been released in Japan and America last year. But it’s here now, and in many ways it certainly is a new beginning for the series. 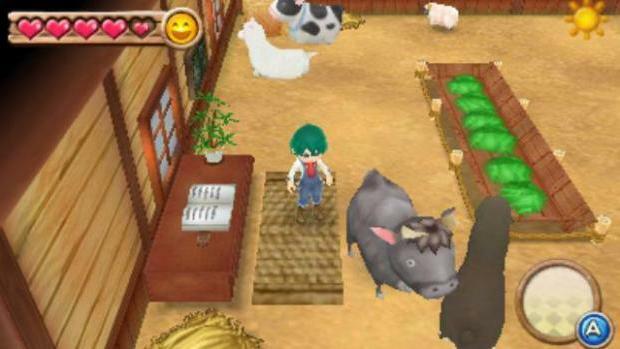 In true Harvest Moon style, you are a young man (or young woman) who has been handed the family farm, which, along with the nearby town, has fallen on hard times. It’s down to you to revitalise both the farm and town, attract more people to move to the area, and settle down with a family. 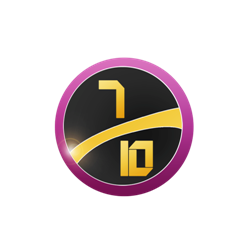 Previously, there would have been a time limit to achieve these goals (usually a few years of in-game time, which are split into four seasons, Spring, Summer, Autumn and Winter); but this time around, there is no set end to the game. Time is infinite, and how far you go with your farming career is up to you. It’s sort of like Animal Crossing in that respect, and it’s nice to not have to worry about time limits anymore. A New Beginning’s early moments are excruciatingly painful. In fact, the entire first season of the game is an absolute drag. Massive components of the game are locked away from your, while overly-long cutscenes and tutorials appear every couple of in-game days. You’ll be forced to watch the inhabitants of your farm shuffle towards you, then jabber on and on about nothing, before giving you a tutorial that could have easily been explained in the first couple of days. During this first month, the only activities you can take part in are the daily grind of planting or watering your plants and crops, looking after your cow and milking it, while taking regular trips to the woods to forage for items you can sell or stockpile for later use. For a series that is known for its slow-pace, this long-winded tutorial doesn’t make sense. New players will quickly get bored and turn the game off, while even veterans will be irritated at having to perform the same grind every day. But if you get past this tedious first month, you begin to experience one of the better Harvest Moon games in recent memory. Customisation is a key part of the game – initially you can only customer your farmer avatar to your own liking, but later on you’ll be able to shape your farm to your liking in the game’s Edit Mode. Here, you can pick up and place items wherever you think they look best. From this moment on, the game begins to open up, with new areas available to explore, including a mine area where resources can be gathered and used to renovate the town using obtainable blueprints. The draw of managing your farm is certainly as strong as it ever was, but the idea of finally being able to easily place buildings and amenities in the exact spot you desire certainly makes you want to put more work into the game than ever before. 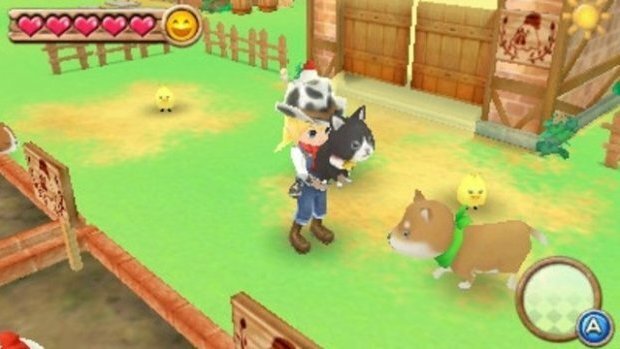 It almost feels as if Harvest Moon is taking cues from Animal Crossing, which is not a bad way for the series to go forward. There’s certainly more to the this than the usual “plant crops, harvest crops, marry a girl” sequence of previous entries. Unlike its sprite-based predecessor (A Tale of Two Towns), A New Beginning relies on fully polygonal visuals to take advantage of the system’s 3D. Everything is as bold and bright as you expect, although the frame rate is noticeably slower in certain areas (usually the outside ones), which is odd as this is far from the most graphically demanding game on the system. The sprites of old have been well converted to polygons, retaining the cuddly art-style that Harvest Moon is known for. Music is expectedly bouncy and happy, possibly reaching the lower register of irritatingly repetitive. Luckily, this is not a game that relies on audio anyway. VERDICT: As mentioned earlier, this is certainly one of the more accessible and playable Harvest Moon games I’ve experienced over the past few years, with its biggest barrier to entry being the excessive locking of content and features. It will require a lot of patience before you can get to the meat of the game, but it’s certainly worth it for would-be farmers. Eventually, you’ll have access to a ton of content and many hours of gameplay. A New Beginning is a good entry point for those new to the series, and certainly worth a look for fans – just be aware that the typically slow pace of the franchise is even slower here. GOOD. A game that scores 7/10 is worthy of note, but unworthy of fanfare. It does many things well, but only a few of them incredibly well and, despite a handful of good qualities, fresh ideas and solid mechanics, it fails to overwhelm. I'm a UK-based writer with a passion for gaming that spans over 2 decades. For years I've been interested in the history of video games and as a result I have quite the collection of console hardware, not to mention a brain bursting with gaming trivia and knowledge. I've been a part of the GodisaGeek family since 2011, writing, talking and doing videos throughout that time. On Twitter I can be located @TheLastMetroid and I can be emailed at lee[at]godisageek.com. I'd love to hear from you!